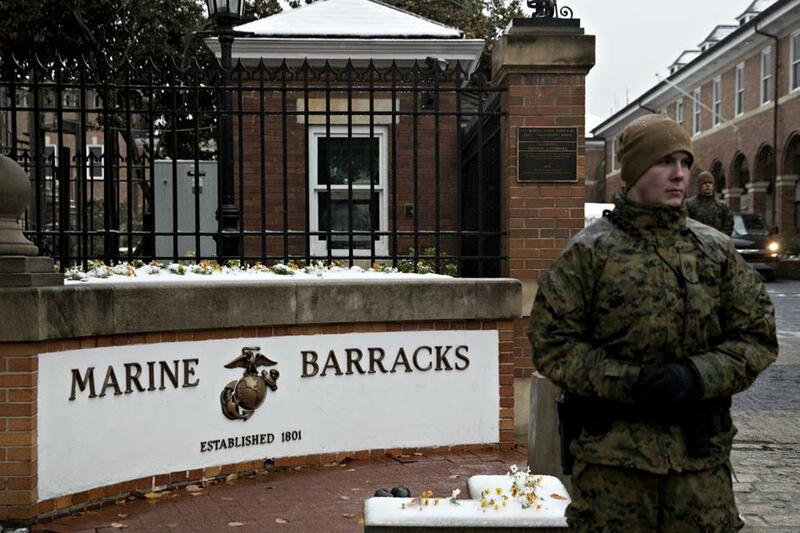 A Marine stands outside the Marine Barracks in Washington, D.C., in November. A Marine was shot and killed inside the barracks Tuesday, police say. Markelle Kuznia told The Associated Press that the military notified her late Tuesday that her son, Riley Kuznia, died early that morning. Kuznia said the military has not provided her with details of her son’s death. ‘‘He just wanted to serve. Ever since he was little, he talked about being a solider,’’ Kuznia said from her home in Karlstad, a community of about 800 people in northwestern Minnesota. ‘‘When he got out (of the military), he was going to start his own construction business. He said he wanted to give five years to his country,’’ she said. He planned to marry his high school girlfriend, she added. Minnesota Gov.-elect Tim Walz tweeted his sympathies to the Marine’s family Wednesday.